ITU « Steven J. Crowley, P.E. The debate won’t end but the volume is dropping on the what-is-4G controversy. Previously, I’ve written about the ITU’s characterization of 4G as only applying to the two radio technologies it has designated as IMT-Advanced: LTE-Advanced and WirelessMAN-Advanced (the latest version of WiMAX). The IEEE 802 Executive Committee today approved correspondence asking ITU for clarification on its use of the term “4G” in an October 21 press release on IMT-Advanced. The main concern is ITU’s characterization of IMT-Advanced as “true 4G.” IEEE 802 observes that some in industry and government use 4G to mean mobile broadband technologies other than IMT-Advanced. Consequently, IEEE 802 says, ITU’s announcement has caused such users to be on the receiving end of “public response” (i.e., negative publicity), and could cause “significant disruption” to existing technical activities and documentation. It also observes that such use of 4G seems inconsistent with ITU-R Working Party 5D’s prior consideration of the term. What’s 4G? Whatever you want. On October 21 the ITU announced it had deemed two mobile broadband technologies as IMT-Advanced. 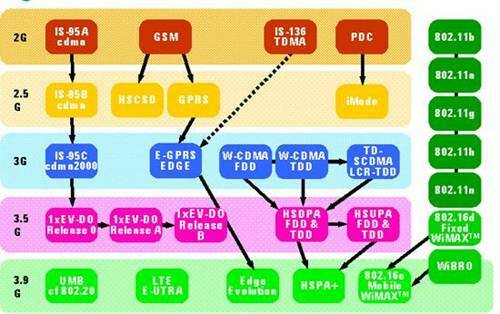 They’re LTE-Advanced and WirelessMAN-Advanced (WiMAX Release 2 based on IEEE 802.16m). At the same time the ITU called these “true 4G technologies,” leading some in the trade press to say that marketing of some existing services as 4G is misleading. No entity is the arbiter of the designations 2G, 3G, or 4G. Even the ITU generally uses these terms parenthetically. It recognizes the lack of consensus on their meaning, and does not say others are wrong. The ITU calls the IMT-Advanced technologies “true 4G,” and they are insofar as ITU has a view of 4G and the two technologies are truly consistent with that view. In some of these articles, Sprint and Clearwire, to name two examples, catch flack for calling their current WiMAX offering 4G. I’d call it 3.5G, but I can’t say they’re wrong. An ABI Research analyst agrees with Sprint and Clearwire; his view is that everything TDMA is 2G, everything CDMA is 3G, and everything OFDMA is 4G, regardless of data rate. It’s a reasonable argument based on backward compatibility, but I’m not ready to agree. If that or something else ends up being the industry consensus, I won’t object. Below is a comparison found on the ITU website. It’s generally consistent with my view. Don’t like these classifications? Make your own. Within reason. ABI analyst link updated with more current post. Steve is a consulting wireless engineer who provides support for projects involving technology analysis, standards, patents, policy, regulation, and corporate communication. Clients include vendors, service providers, asset managers, government agencies, and other professional service providers.